But sometimes, afternoon workouts are inevitable. If your field hockey games are every week at 2 p.m., Casa says you need to be training in that type of heatall the time so you’re used to it. With that said, work your way up to it—don’t just start doing intense workouts in the sweltering heat from the start. It’s okay to take breaks and go slow. It’s important to fill your workout wardrobe with clothes that keep you cool and dry on days where it may feel like you’ve taken up permanent residence on the sun. Bergeron advises wearing items that are lightweight, breathable, and thatprotect your skin from UV radiation. Dry-fit clothing, which helps wick moisture and prevents the buildup of excess body heat, is also a great option. As we hit high-heat season in the Northern Hemisphere, it is useful to clarify tactics that can be used to help maintain healthy body temperatures. These tips are not commonly known and can be adopted by anyone, anywhere. While I am a climate scientist, my funded work is in the area of heat transfer, particularly in the human body. I work with medical companies to maintain healthy body temperatures during surgeries or other situations. I also deal with scald burns and I often serve in burn injury litigation. The general rule is to cool as much of the body’s surface as possible …. the larger the area you cool and the colder the device you use to cool it the faster the cooling rate. An appropriate goal is to use a method that cools at a rate of 0.15°C per minute. This can typically be achieved by immersion techniques using a tub or other basin filled with ice cold water or via rotating cold ice towels over the body. During exercise if there is limited access to the entire body (e.g. football or fire-fighters), cooling the hands, face and feet will help, and if possible, use a fan to increase evaporation from these surfaces. 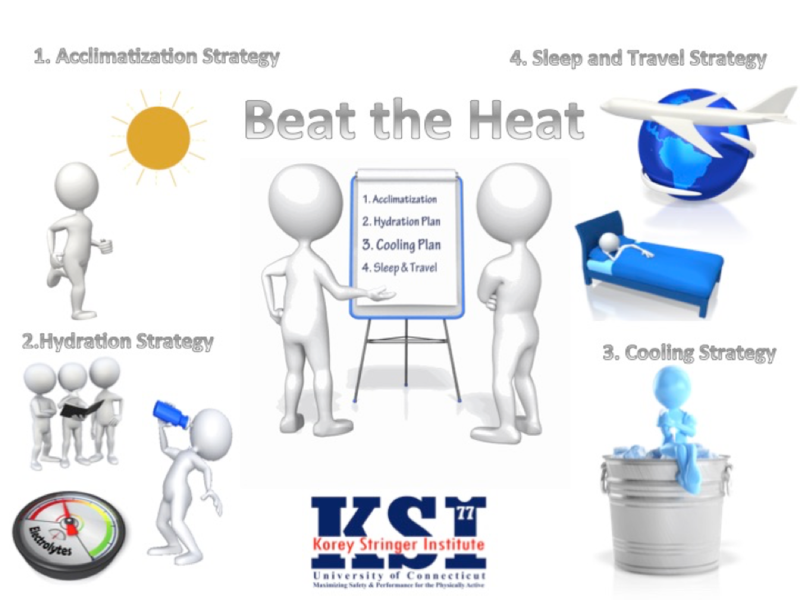 However, when heat stroke is suspected, these strategies are not nearly as effective as whole body methods; opt for immersion cooling. So how do you know if someone is suffering from hyperthermia or heat stroke? A great resource is the Korey Stringer Institute, which lists many symptoms for heat stress such as fatigue, weakness, pale appearance, headache, nausea, vomiting, fainting, dizziness, and others. The heat stroke treatment they recommend, while geared toward athletes, is still useful for the rest of us. The list removal of clothing and equipment, cooling of the athlete using 30 minutes of whole body immersion in cold water (or a cold shower), call for medical treatment, and other tips found here. A journal publication was published in 2010 that also recommended cold-water immersion for treatment of exertional heat stroke. That publication does warn that over cooling can lead to hypothermia, so care must be taken. In many actual situations, full body immersion isn’t possible. What can people do then? Well, there is extensive evidence that supports the cooling of the hands, face and feet. The technical term for these areas is glabrous (non-haired). These areas are excellent at transferring heat and in fact, the body can increase the blood flow to these regions which, when cooled, flows back to the body providing core cooling. Application of cold packs to glabrous skin surfaces was more effective for treating exercise-induced heat stress than the traditional CCP cooling intervention. This novel cooling technique may be beneficial as an adjunctive treatment for heat-related illness in the prehospital environment. These studies should be viewed as helpful however they often deal with lower temperature heat stress; for very high body temperatures, immersion is recommended. Another recent publication, this time in one of the top biomedical engineering journals, looked at heat transfer in people that were insulated, again they found effective cooling in individuals when the hand was targeted with 10°C (50°F) water. For people who are interested in learning more, a great resource is this 2014 PhD Dissertation from the University of Connecticut. That study looked at the effects of hand cooling and found that while it shows some promise, more research is needed, particular on the interactions of hand cooling with other factors. Coaches and parents would immediately pull kids from a lightning storm, yet the perception of heat as a risk is lower. Dr. Michelle Hawkins is the Climate, Weather and Health Lead in the National Weather Service (NWS) Climate Services Branch. She told me, CDC found that over 650 people die per year from exposure to extreme heat (most of any weather threat). These deaths are preventable. Heat is considered a silent killer. It doesn’t come in toppling down trees or damaging homes, and often people don’t even know that they are suffering from heat illness. Three medical doctors recently wrote in a scholarly journal that hot, humid conditions are “the single most critical predisposing risk factor” associated with exertional heat illness. According to the National Center for Catastrophic Sports Injury Research, 52 football players died over the period 1995 to 2012 from exertional heat stroke (EHS). Korey Stringer, a pro-bowl tackle for the Minnesota Vikings, died in 2001 after collapsing from a morning practice in 91 degree heat. His body temperature reached 108 degrees and exhibited classic symptoms of heat stroke. 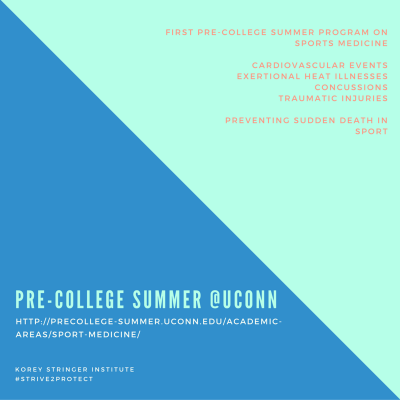 His death elevated the issue, and the Korey Stringer Institute was established, to provide research, education, advocacy and consultation to maximize performance, optimize safety and prevent sudden death for the athlete, soldier and laborer. Professor Andrew Grunstein of the University of Georgia (UGA) is an international expert on weather and heat-related issues. In 2012, he and colleagues published a studied noting that heat-related football deaths tripled between 1994 and 2009, and the state of Georgia led the way. Their study developed a national database with information on humidity, temperature, time of day and attributes (height, weight, position) of the football players who died from hyperthermia.Hyperthermia is when the core body temperature is elevated above normal (not to be confused withhypothermia which is abnormally low body temperature). Grundstein, who collaborates with the Korey Stringer Institute, pointed out that the heat index seemed to be increasing in more recent years and players, particularly linemen, have gotten larger in size. Both of these factors increase risk. Competitive pressure to compete and lack of literacy on the dangers of heat are big challenges. I also believe misguided statements like “I did it when I was coming up” or “it will make them tougher” are dangerous. Many coaches don’t understand that changing climatological conditions and physical structure of kids today place them at greater risk. Further, experts point out that today’s kids spend less time playing outside and are not as acclimated to the heat (coupled with 10 to 20 extra pounds of pads). These facts may illustrate why many of the deaths or acute illness come during the first few days of practice under extreme heat conditions. Signs of heat illness include: Exertion-associated muscle cramps or spasms, forced breathing, vomiting, confusion, dizziness, dark urine and heat syncope (periodic loss of consciousness). Some best practices for responding to these symptoms can be found here.Are there proactive efforts for youth football given what we know? In 2012, the Georgia High School Association (GHSA) adopted new guidelines after briefings from Professor Grundstein and Michael Ferrara, a former UGA professor of kinesiology (now a Dean at the University of New Hampshire). A press release pointed that new guidelines, require that the first week of practice consist of single-practice days with sessions no longer than two hours with helmets only. During the second week, teams can start two-a-day practices with full equipment, but they cannot have consecutive double-session days: a double-practice day must now be followed by a single-practice day. There has to be at least three hours of rest between sessions on a double-practice day and double-day sessions cannot exceed five hours of practice time. Professor Grundstein emphasized that more heat safety policies are being implemented at the interscholastic level and youth sport levels. USA football, for example, has a good heat safety policy. But he cautioned many youth programs do not. There is definitely room for improvement in heat safety education for youth sports. Scientists also continue to learn more. For example, Wet Bulb Globe Temperature (WBGT index) is the standard measure of environmental heat stress. It measures humidity, temperature and radiant temperature. Research indicates that a WBGT of 82 degrees is a critical threshold. The WBGT, via the radiant heat, accounts for the direct heat load on the athlete. Heat index does not. UGA researchers explained, modifications to the scale will include an increase in rest breaks, hydration periods, equipment modifications and duration of practice as heat stress rises. This provides schools, medical staff and coaches with flexibility in designing their practice to be as safe as possible said Bud Cooper, associate department head for the department of kinesiology. I enjoy football as much as the next person so don’t take this article in the wrong way. I just want our kids to be safe. After a few deaths on Arizona hiking trails this summer, the Phoenix Parks and Recreation Board met last week to discuss whether to close the city’s hiking trails in extreme heat. The proposal was rejected after opposition from hikers, although the board did approve a ban on dogs on hiking trails when the temperature reaches 100 degrees. One couple from Great Neck, New York, has made it their mission to educate people about the dangers of hiking in extreme heat conditions. Mark and Ellen Newman worked together with Yoram Epstein of Tel Aviv University and Dr. Douglas Casa of the University of Connecticut’s Korey Stringer Institute to create Ariel’s Checklist, which includes 10 points that every hiker and hike leader needs to know to prevent exertional heat stroke (EHS). The list is named after their son, Ariel Yitzchak, their only child, who died in September 2014 of EHS while on a hike in the Judaean desert, shortly after arriving in Israel for his gap year. According to Newman, Masa, part of the Jewish Agency for Israel headed by Natan Sharansky, will officially make Ariel’s Checklist the written standard against which all hikes must be judged for Masa members. Additionally, the Israeli Ministry of Tourism is in the process of making expert knowledge of Ariel’s checklist the requirement to receive a tour guide license. 1. Acclimate to the heat: Extensive exercise should be gradually phased in over a 14-day heat acclimation period. 2. Ensure the hike is appropriate to the skill level of the hikers. 3. Ensure hydration: Ensure that each hiker has an adequate amount of water for the duration of that particular hike, and the hiker should also be hydrated before and after the hike. 4. Dress appropriately: Wear loose-fitting, absorbent or moisture-wicking clothing, as well as a hat when hiking in daylight. Wearing waterproof clothing or clothing made out of material such as nylon that retains heat does not allow the body to evaporate perspiration freely and normally and is dangerous. 5. Ensure adequate sleep. Sleep loss has been shown to impair the body’s ability to regulate body temperature adequately. 7. Ensure adequate work/rest cycles to avoid overheating. 8. Avoid midday hiking: Avoid hiking in the desert during the hottest part of the day. 9. Prepare for medical emergencies: Bring a variety of resources to help anyone suffering from the heat. 10. Insist on safety: Emphasize repeatedly to everyone before and during the hike that it is perfectly fine – and mandatory – to speak out at any time if they are not feeling well. With the Summer Olympics in Rio de Janeiro set to begin in less than a month, athletes are making their final preparations for their opportunity to compete on the world’s biggest stage. For some athletes their performance in the Rio Olympic games may not be solely reliant on the calculated training program and countless hours they’ve dedicated. Instead, their performance could hinge on their ability to prepare for the abnormal heat expected in Rio. With average August temperatures in Rio ranging from the mid 60’s to mid 70’s, temperatures have been forecasted to be in the mid 80’s throughout the games. This potential obstacle outdoor athletes in the Rio might face presents a great opportunity to review key essentials and strategies to optimizing performance in the heat. Repetitively exercising in the heat improves cardiovascular efficiency and therefore performance through expansion of blood plasma volume, which leads to increased stroke volume and decreased heart rate. Heat acclimatization improves sweat rate and sweat sensitivity so that evaporative heat loss is enhanced and internal core temperatures remain cooler. Exercise in the heat should be at least 60 minutes per day to induce physiological adaptations. If possible, train in the same environment as the competition or plan to train at or near the venue for several weeks prior to competition. Exercising in hot environments increases evaporative heat loss (via sweating) and can lead to progressive dehydration (i.e. reduced plasma volume) and increased rates of heat storage if fluids are not adequately replaced. Athletes exercising in hot environments often lose 1-1.5 liters of sweat per hour, however some individuals sweat rates can exceed 2.5 liters/hour. Athletes should develop individualized hydration strategies based on their sweat rate in a hot environment as drinking to thirst often results in body water deficits which can exceed 2-3% body mass. 2-3% body mass deficits have been associated with decreased performance. Athletes training and competing in a warm-hot environment have higher sodium (i.e. salt) losses and therefore requires more sodium than athletes competing in a cooler environment or the general population. Post-training hydration routine should include fluid, sodium, carbohydrates and protein. Athletes should develop an appropriate cooling strategy applying external cooling methods (i.e. ice towels, ice bath, or cooling garments) and internal cooling methods (i.e. cold fluid ingestion) specific to their sport, event and individual needs. Skin cooling can reduce cardiovascular strain, while whole body cooling can reduce organ and muscle tissue temperature. Athletes can cool prior exercise to decrease body temperature and heart rate, during exercise to decrease rate of temperature rise, and after exercise to decrease muscle damage and reduce metabolic response to exercise. Sleep deprivation can impede thermoregulation in hot environment by decreasing evaporative heat loss mechanisms (i.e. sweat rate and sensitivity). Travel, especially across several time zones, can disrupt the body’s natural sleep and wake cycle (i.e. circadian rhythm disruption). Rapid adjustment of the body’s biological rhythms is necessary for ensuring sleep quantity and quality is gained and maximal performance is not lost. Plan for 1 day of sleep recovery for every time zone crossed. For example, two weeks of adjustment time would be optimal for travel across the 14 time zones between NY, USA and Sydney, Australia. Practice good sleep hygiene habits such as reducing alcohol and caffeine prior to bed, prioritize a 20-30 minute wind down time, maintain a consistent sleep schedule, and power down technology one hour prior to bed. Pryor RR, Casa DJ, Adams WM, Belval LN, DeMartini JK, Huggins RA, et al. Maximizing Athletic Performance in the Heat: Strength and Conditioning Journal. 2013 Dec;35(6):24–33.